AstaXanthin is the ultimate antioxidant - it is said to have up to 550 times the antioxidant capacity of Vitamin E, and up to 10 times the antioxidant capacities of Beta Carotene adulterine. A naturally occurring carotenoids pigment, with powerful antioxidant action. 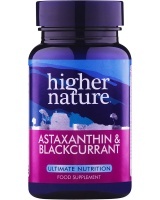 Research suggests that Astaxanthin has tremendous promise for maintaining healthy eyes, joints & the immune system. A potent antioxidant to maintain eyesight and fertility.